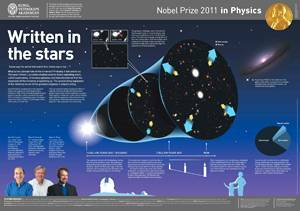 This Nobel Physics 2011 “Written in the Stars” poster is online at: www.kva.se/en/Prizes/Nobel-prizes, and available in paper by email request. It was awarded to three men at lower left for "the discovery of the accelerating expansion of the Universe." Indeed humankind’s textual, edifying quest has come to span such celestial reaches. But the child at the lower right needs to be rewarded with a revolutionary universe that includes our human selves in its developmental course toward an intelligence meant to decipher the stellar script. And what might nature's true language be – could a 21st century worldwisdom realize it genetic-like in kind from cosmic parents to planetary progeny? Thus we offer “Naturome” as a literacy singularity. Codex Sinaiticus. http://www.codex-sinaiticus.net/en/. A new website online in July 2009 as a digital version of the oldest known Christian Bible, via a joint project of the British Library, National Library of Russia, St. Catherine’s Monastery, and the Leipzig University Library. Its several hundred large (~15 X 14 inches) leaves of prepared animal skin are attributed to a number of scribes, along with signs of post editing. The endeavor, hailed for its historic significance, evinces the importance of a scriptural basis for Abrahamic Western culture. But what, if anything, has been revealed or learned since? The two cultures of postmodern humanities and a Ptolemaic physics, in their quandaries, lately deny any creation or purpose. However might we peoples just now imagine, decipher, and read an ordained, salutary 21st century natural testament? 'Codex' means 'book'. By the time Codex Sinaiticus was written, works of literature were increasingly written on sheets that were folded and bound together in a format that we still use to this day. This book format was steadily replacing the roll format which was more widespread just a century before when texts were written on one side of a series of sheets glued together to make a roll. These rolls were made of animal skin (like most of the Dead Sea Scrolls) or the papyrus plant (commonly used for Greek and Latin literature). Opening the Book of Nature. www.bookofnature.org. A website for a California-based ministry with this title name, which was a onetime 2007 posting. Our interest is its Nature as a Great Book page with over 50 citations to this effect across two thousand years. The entries are drawn from the Abrahamic faiths and beyond, along with ecologists and poets. They course from the Bible, Origen, St. Ephraim the Syrian, St. Augustine, Muslih-uddin Sa’di Shirazi, St. Bonavanture, Thomas Aquinas, Meister Eckhart, Dante, Martin Luther, Dogen Kigen, Shakespeare, Galileo, William Penn, Longfellow, Baha’u’llah, John Ruskin, John Burroughs, George Washington Carver, Martin Buber, Aldo Leopold, Fritjof Schuon, Matthew King, Lakota Nation, to Pope John Paul II. It may then be noted that every entry is by a man except for St. Therese of Lisieux. In this trope a natural scripture is seen as a reflection of its Creator rather than about any innate identity or worth of this extant world. Into this third millennium, a Book of Naturome due to our worldwise humankinder can now reveal both a transcendent and immanent parental origin and image along with an evolutionary genesis of a planetary progeny. Such a divine destiny was the essence of the Jesuit paleontologist Pierre Teilhard de Chardin’s 20th century contribution. I was coeditor of Teilhard in the 21st Century: The Emerging Spirit of Earth (2004), which gathered chapters to envision, along with an advocacy of a sustainable environment. Ablondi, Fred. Reading Nature’s Book: Galileo and the Birth of Modern Philosophy. New York: Peter Lang, 2016. A Hendrix College philosopher revisits and reminds of this iconic 17th century discernment of an edifying mathematical literacy by which to read and avail a natural creation. See also The Found and the Made by Dan Brugier (Transaction, 2016) for another paean to an innately textual nature made for us to learn to read. Allahyari, Mehdi, et al. A Brief Survey of Text Mining. arXiv:1707.02919. A University of Georgia, Athens, GA, computer informatics team of MA, Seyedamin Pouriyeh, Mehdi Assefi, Saied Safaei, Elizabeth Trippe, Juan Gutierrez, and Krys Kochut review the latest automatic summary methods to retrieve and distill meaningful content from the vast flow of online literary corpora, broadly conceived. A companion piece is Text Summarization Techniques at 1707.02268. And to reflect, a natural narrative is implied whence our human role may be to learn to read, write, comprehend and continue this procreative realm written in a genetic language. Barton, David. Literacy: An Introduction to the Ecology of Written Language. Oxford: Blackwell, 1994. How might we altogether imagine a textual cosmic literacy? An ancient truth avers that we are immersed in a natural scripture, which we yet do not know how to read, a perception which inspired the Renaissance revolution of Copernicus, Galileo, and Newton. Although postmodernity lauds ‘grammatology,’ it rejects in their despair any such abiding narrative. This present book is a lucid tome all about writing and reading systems and their achievement. Berry, R.J. God’s Book of Works. London: T & T Clark, 2003. In his Gifford Lectures, a scientist employs the popular two books concept of God’s scriptural word and the created realm as complementary expressions of the same truth. Biagioli, Mario. Galileo’s Instruments of Credit. Chicago: University of Chicago Press, 2006. The concluding long chapter, The Supplemental Economy of Galileo’s Book of Nature, provides novel insights into how this metaphor of a natural revelation which complements Divinely inspired scripture was deftly employed in order to keep the clerical inquisitors at bay while defending scientific exploration. Bono, James. The Word of God and the Languages of Man. Madison, WI: University of Wisconsin Press, 1995. A study of the pervasive but cryptic image of a Divinely authored natural testament in the medieval mentality. Botz-Bornstein, Thorsten. Genes, Memes, and the Chinese Concept of Wen: Toward a Nature/Culture Model of Genetics. Philosophy East & West. 60/2, 2010. The author is a Tuskegee University philosopher with an Oxford University doctorate, and a previous post at Zhejiang University in China. The article first notes how the traditional Chinese organic cosmology is deeply literal and textual in kind, as expressed by “wen,” a term for fluid pattern, structure, writing, and poetics. Such qualities then serve to “auto-generate” a dynamic biological becoming, distinct from western moribund mechanism. In such wisdom, dual natural realms abide of extant, overt worlds, and their intrinsic, descriptive source. The paper goes on to say that if nature and culture are seamlessly scripted, from a 21st century vantage might these ancient articulations be seen as intimating a “genetic” agency from molecular DNA to societal discourse. (And one may add the latest quantum, algorithmic, information/computation theories) A significant further connection is then made of this Eastern literal essence with the Greek and later Christian “Liber Mundi” or book of nature trope of the world most of all as “word,” a patently readable creation. This is a rare and important comparison that can potentially, as not before, join bicameral Abrahamic and Asian realms into a single natural revelation. Brandt, Christina. Genetic Code, Text, and Scripture: Metaphors and Narration in German Molecular Biology. Science in Context. 18/4, 2005. In this international journal from the Cohn Institute for the History and Philosophy of Science and Ideas, Tel Aviv University, a Max Planck Institute for the History of Science scholar provides an insightful review of decades of cross-fertilization between bioinformational and linguistic realms, with an emphasis on the work of philosopher Hans Blumenberg and biochemist Gerhard Schramm. Butner, Jonathan, et al. When the Facts Just Don’t Add Up: The Fractal Nature of Conversational Stories. Social Cognition. 26/6, 2008. By applying dynamic systems theory, University of Utah psychologists are able to parse conversational reports so as to quantify an inherent thematic repetition, as per the extended quote. We note in this section for it lately seems, via worldwide mindkind, that universe to human natural creation likewise nests and repeats the same story over and over, as it reflects the intrinsic genomic code everywhere. Here, in such an organic gestation at its earthly nativity, could be a once and future great illumination for us. Changizi, Mark, et al. The Structures of Letters and Symbols throughout Human History are Selected to Match Those Found in Objects in Natural Scenes. American Naturalist. 167/5, 2006. Caltech neurobiologists find universal geometries across a wide range of alphabets, logograms, and symbols, which can then be traced to the shapes of natural objects that primate brains have evolved in a response to.